Millennia of selective breeding have resulted in varieties that look quite different. Also, breeding since circa 1930 has focused quite specifically on producing strains which would perform very poorly as sources of drug material. Hemp grown for fiber is planted closely, resulting in tall, slender plants with long fibers. “Until the early 1900s industrial hemp was a valuable crop used all over the world for its strong fibers and oil seeds. Today, however, the common perception of the industrial hemp plant is generally negative and associated with the drug marijuana. This perception is the legacy of a century of powerful influences constructing hemp as a dangerous drug, even though it is not a drug and it has the potential to be a profitable alternative crop. In the United States, the public’s perception of hemp as marijuana has blocked hemp from becoming a useful crop and product,” in spite of its vital importance prior to World War II. Ideally, according to Britain’s Department for Environment, Food and Rural Affairs, the herb should be desiccated and harvested towards the end of flowering. This early cropping reduces the seed yield but improves the fiber yield and quality. In these strains of industrial hemp the tetrahydrocannabinol (THC) content would have been very low. The seeds are sown from mid April to mid May with grain drills to 4–6 cm sowing depth. Hemp needs less fertilizer than corn does. A total of 60–150 kg of nitrogen, 40–140 kg phosphorus (P2O5) and 75–200 kg of potassium  per acre for hemp fiber made before sowing and again later, maybe three to four weeks. When practiced, especially in France double use of fiber and seed fertilization with nitrogen doses up to 100 kg / ha rather low. Organic fertilizers such as manure can utilize industrial hemp well. Neither weeds nor crop protection measures are necessary. Cannabis sativa L. subsp. sativa var. sativa is the variety grown for industrial use, while C. sativa subsp. 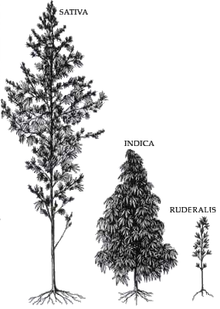 indica generally has poor fiber quality and is primarily used for recreational and medicinal purposes. The major difference between the two types of plants is the appearance and the amount of Δ9–tetrahydrocannabinol (THC) secreted in a resinous mixture by epidermal hairs called glandular trichomes, although they can also be distinguished genetically. Oilseed and fiber varieties of Cannabis approved for industrial hemp production produce only minute amounts of this psychoactive drug, not enough for any physical or psychological effects. Typically, hemp contains below 0.3% THC, while cultivars of Cannabis grown for recreational use can contain anywhere from 2% to over 20%. Industrial hempseed harvesting machine in France. The cut hemp is laid in swathes to dry for up to four days. This was traditionally followed by retting, either water retting (the bundled hemp floats in water) or dew retting (the hemp remains on the ground and is affected by the moisture in dew, and by molds and bacterial action). Modern processes use steam and machinery to separate the fiber, a process known as thermomechanical pulping. For profitable hemp farming, particularly deep, humus-rich, nutrient-rich soil with controlled water flow is preferable. Water logged acidic, compressed or extremely light (sandy) soils primarily affect the early development of plants. Steep slopes and high altitudes of more than 400 m above sea level are best avoided. Hemp is relatively insensitive to cold temperatures and can withstand frost down to -5 degrees C. Seeds can germinate down to 1-3 degrees. Hemp needs a lot of heat, so earlier varieties come to maturation. The water requirement is 300-500 l / kg dry matter. Up to 3 feet growing roots into the soil can also use water supplies from deeper soil layers. Worth noting is that the water requirement of hemp is at least 14 times lower than that of cotton which takes between 7 000-29 000 l/kg, according to WWF. Hemp benefits crops grown after it. For this reason it is generally grown before winter cereals. Advantageous changes are high weed suppression, soil loosening by the large hemp root system and the positive effect on soil tilth. Since hemp is very self-compatible, it can also be grown several years in a row in the same fields (monoculture).